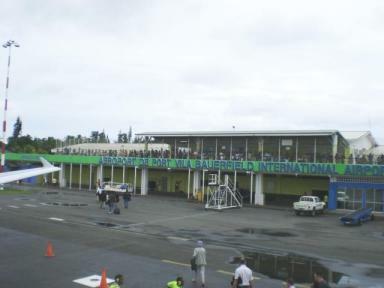 Bauerfield International Airport (IATA: VLI, ICAO: NVVV) is an airport located in Port Vila, Vanuatu. The airport is relatively small in size, but its runways have the capability and length to accept jets up to the Boeing 767s. It serves as the hub for Vanuatu's international airline, Air Vanuatu. NB: Air Vanuatu also fly from Aniwa to Port Vila inbound only, and to Ipota, Sola, & Torres from Port Vila outbound only. This page was retrieved and condensed from (http://en.wikipedia.org/wiki/Bauerfield_International_Airport) see Wikipedia, the free encyclopedia, May 2008. This information was correct in May 2008. E. & O.E.